While at work, you slauch in your chair as you hurriedly finish a report. 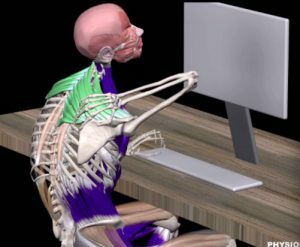 Image above showed how you normally sit, for long hours. You may not feel any ill-effects after sitting too long but over time the stress that poor posture places on your spine can lead to anatomical changes in your spine. From the image above, we can see that the back is rounded. This posture restrict the movement pf diaphragm as it is compressed by organs at the chest area and abdominal area. Therefore, the respiratory system will not be able to function as normal. The anterior external intercostal will be shorten and posterior external intercostal will be lengthen. Three group of main muscles who work when breathing at rest are diaphragm, external intercostal muscle and scalene. 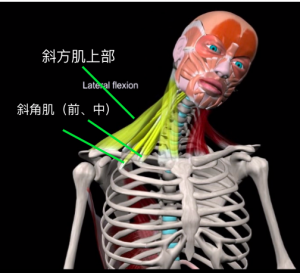 Due to dysfunction of external intercostal muscle and diaphragm, the scalene muscle group at the neck area have to work harder during inhalation. This lead to overstress at the neck area. 2. Training on our back (lattisimus dorsi and serratus anterior). Practice breathing exercise by lying down sideway, we are able to strengthen external intercostal muscles. While lying down sideway, organs in the body will flow down following the gravity. the external intercostal muscle at the upper side will work easily in inhalation. Practice on both side of the body for greater effect.